Goddess Bhuvaneshvari Devi is one of the ten Mahavidya . 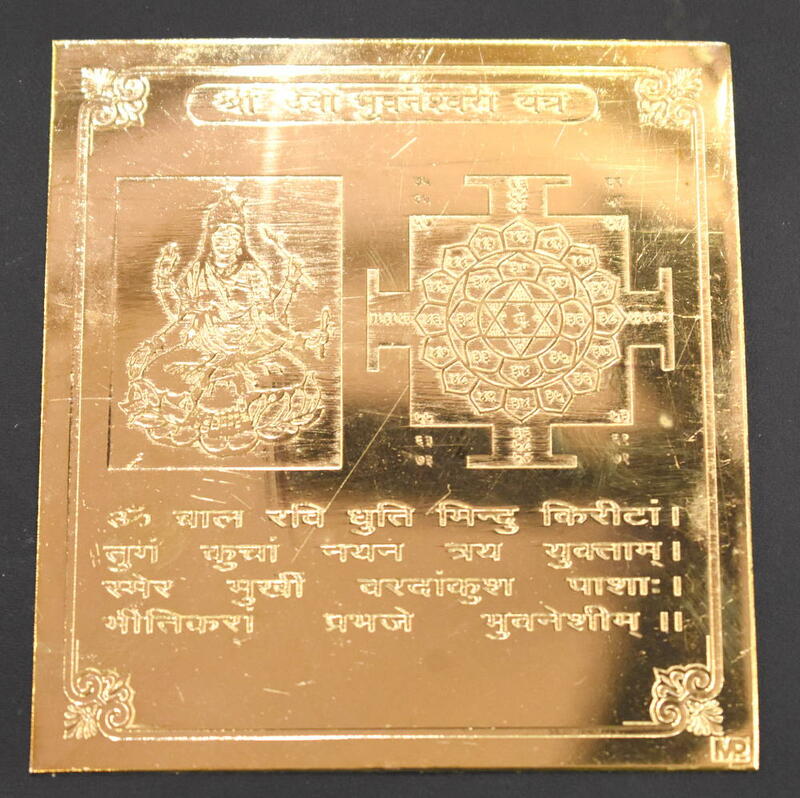 This Yantra also has an image of Goddess Bhuvaneshvari devi and Bhuvaneshvari Devi mantra etched on it’s surface . Bhuvaneshvari is associated with Planet Moon . In this form she came to be known as Bhuvaneshvari, literally “Mistress of the World.” Bhuvaneshvari thus remains un-manifest until the world is created. Hence she is primarily related with the visible and material aspect of the created world. More than any other Maha Vidya with the exception of Kamala (mentioned later), Bhuvaneshvari is associated and identified with the energy underlying creation. She embodies the characteristic dynamics and constituents that make up the world and that lend creation its distinctive character. She is both a part of creation and also pervades it’s aftermath. 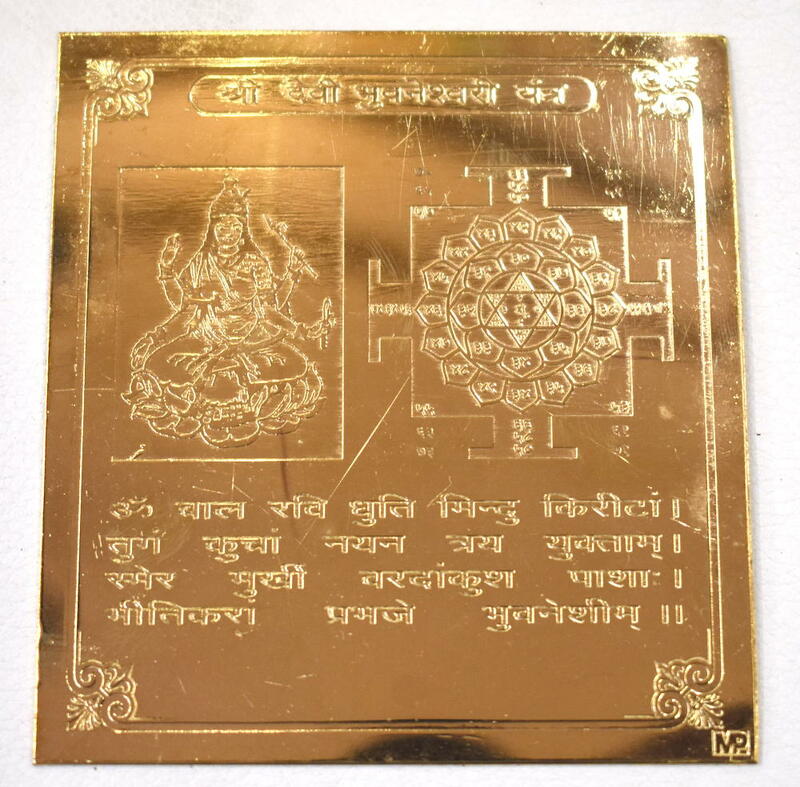 Bhuvaneshvari beauty is mentioned often. She is described as having a radiant complexion and a beautiful face, framed with flowing hair the color of black bees. Her eyes are broad, her lips full and red, and her nose delicate. Her firm breasts are smeared with sandal paste and saffron. Her waist is thin, and her thighs, buttocks, and navel are lovely. Her beautiful throat is decorated with ornaments, and her arms are made for embracing. Indeed Shiva is said to have produced a third eye to view her more thoroughly. This beauty and attractiveness may be understood as an affirmation of the physical world. Tantric thought does not denigrate the world or consider it illusory or delusory, as do some other abstract aspects of Indian thought. This is made amply clear in the belief that the physical world, the rhythms of creation, maintenance and destruction, even the hankerings and sufferings of the human condition is nothing but Bhuvaneshvari play, her exhilarating, joyous sport.